Rock and Roll fans of Saint Louis came together last night at Hollywood Casino’s Amphitheater to travel back in time and witness some of the greatest rock artists of the late 70s and early 80s perform. Weather cooperation, old rock band tees, and the nostalgia of the classic rock and roll music were three key components in making this night a memorable one for all. As expected, the crowd drawn to Styx’s concert was that of the older folk. Most of the venue was packed with fans who had been to plenty of Tesla, Joan, and Styx concerts back in their teenage years when rock bands were in their prime. However, to make the atmosphere all the more interesting, there were younger groups of fans who had never been to a Styx concert in their life. To be able to watch groups as respected as Tesla, Joan Jett, and Styx even after their prime is a privilege, and the youth knew that. There was a lot of love, a lot of respect, and a lot of peace shared across the entire venue. The young and the old generations united together to reminisce on what used to be, and what still is, an influential group of musicians. Tesla started out the evening and included performances of hit songs “I Wanna Live,” “What You Give,” and “Signs.” Jeff Keith stressed the concepts of peace, love, and kindness several times throughout the show, sending everyone back to the late 70s when hippies were popular. He even used the term “bitchin’,” a phrase most people haven’t heard or used in decades. To close their set, the band performed “Modern Day Cowboy,” and on came Joan Jett and the Blackhearts. Finally, Styx took the stage, starting out with “Overture” and “Gone Gone Gone.” To see James Young, Tommy Shaw, Lawrence Gowan, and Ricky Phillips take the stage after nearly fourteen years of waiting for another album to release was already a privilege in itself to fans, but to see the band perform alongside each other and still act like teenage rock-stars made the experience enchanting. Gowan certainly still has the capability to bust a move, which had the crowd going nuts and kept them on their feet, and he still plays the keys in such a mesmerizing way. He could go from playing the keys perfectly without looking down, to playing with his back turned, to running around in circles while the keyboard followed his every move. As usual, James Young knew how to party, though he wouldn’t reveal what exactly he was doing to keep his fun going. Instead, he hinted that his organs were definitely going to be receiving the short end of the stick. Each and every member performed as if they were teenagers again. They were full of energy, talent, and ambition. Even after all these years, original Styx concert attendees could feel as if they were watching a performance from the 80s all over again due to the uplifting energy the band brought into the venue. Chuck Panozzo was able to come out and perform a few songs with the band, including “Come Sail Away” and “Fooling Yourself.” Other hit songs performed included “Too Much Time on My Hands,” “Suite Madam Blue,” and “Radio Silence.” Something particularly interesting about the show is that JY, Tommy, and Lawrence all received a solo moment in the spotlight. Lawrence was able to take the stage on his own a couple times, performing a wicked piano solo and a cover of Queen’s “Bohemian Rhapsody.” And of course, Chuck was able to have his spotlight when he wowed the crowd by cracking out the old bass, even if he was not able to play the entire show. To close, Styx performed their iconic songs “Mr. Roboto” and “Renegade.” Tommy certainly received a lot of love for “Renegade,” but the fans were especially interested in “Mr. Roboto” during the encore, considering it would most likely be the first time they’d hear Tommy and JY perform the song together, and possibly the last. Overall, the show was a blast and felt like a travel was taken back into time. A night to reminisce on the old bands they love, and a reason to raise their cigarette lighters in the air, fans were sure to have enjoyed every second of Tesla, Joan Jett, and Styx. 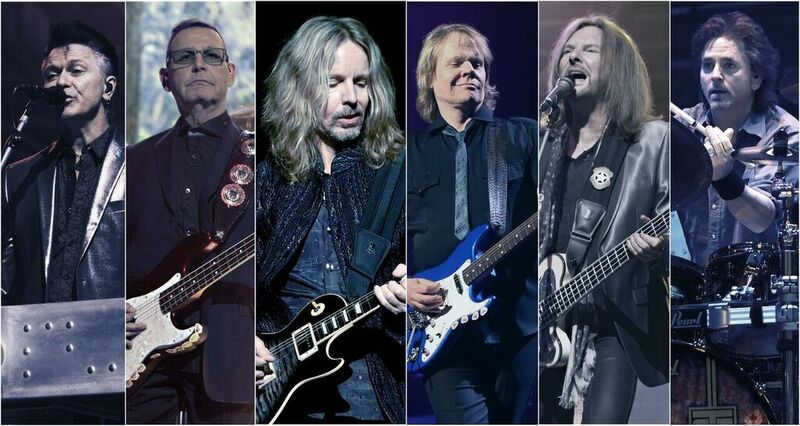 Styx will continue to tour until October 5th in Stateline, Nevada. Tickets are still available for nearly all tour dates.